With a new film coming and current comic book from BOOM! Studios King Kong is quite popular but he has been part of the comic book world more then some my realize. Some of those apprearances came from Marvel and DC Comics, Kong made multiple ​appearances in the Marvel Universe, one as a giant robot ape called "Kong" appeared in Nick Fury, Agent of SHIELD #2 in 1969, drawn to look exactly like the famous movie monster. 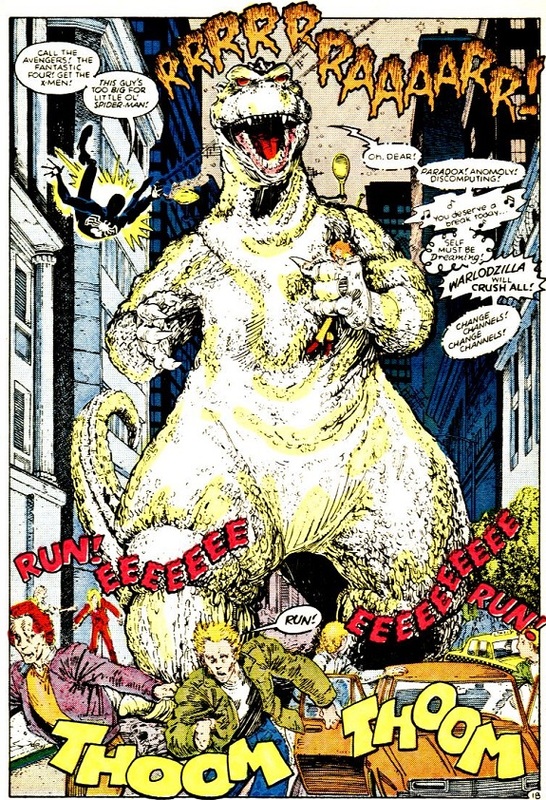 The character Warlock from The New Mutants turned into Godzilla and then King Kong (one of those interesting trivia fact) during a rampage through New York City in Web of Spider-Man Annual No. 2 from 1986. In Webspinners: Tales of Spider-Man No. 1 from 1999, Peter Parker is seen watching the film King Kong at a cinema alongside Quentin Beck. He would return to watch the film again in issue #3. For DC, he appeared via a poster in 1961's Adventure Comics #289. 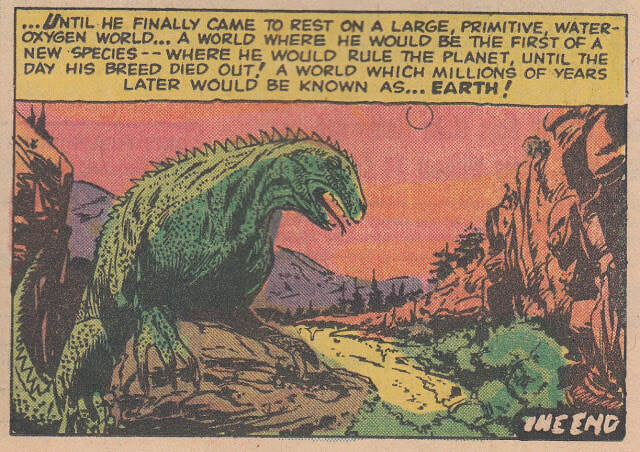 In that comic's back-up strip called Tales of the Bizarro World, Bizarro encounters Titano on Earth's prehistoric past. When he returns to his home world, he's inspired to make a TV series based on the character only to be accused of ripping off King Kong. 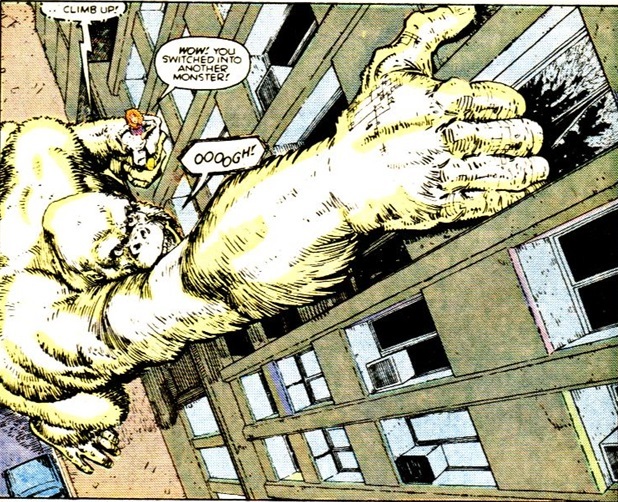 King Kong appeared as a statue in Superman's Girl Friend Lois Lane No. 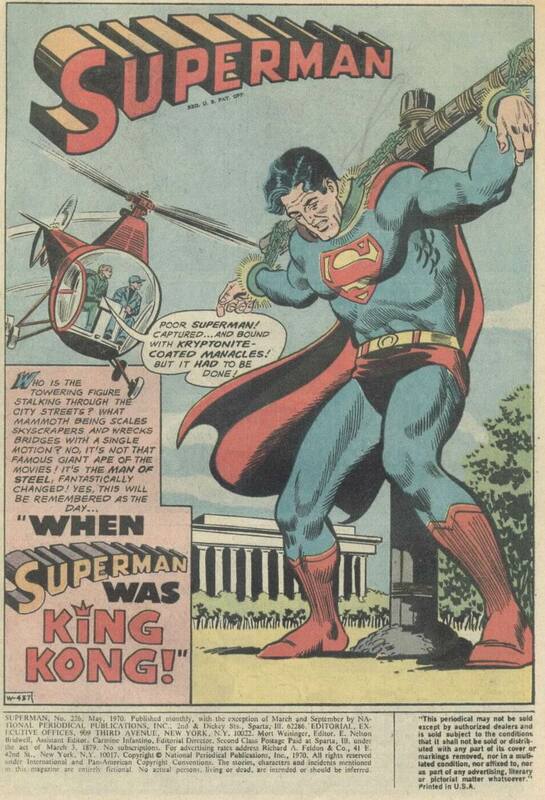 73 in 1967 and as a robot brought to life (among other giant robots in an amusement park created by Toyman) to fight Superman in Adventures of Superman No. 475 in 1991. In issue No. 226 of Superman in 1970, Clark Kent is seen watching the film King Kong at a Metropolis cinema and after being exposed to Red Kryptonite (as Superman) grows into a giant who rampages through the city in a story called When Superman became King Kong!. In issue No. 120 of Weird War Tales from 1983, G.I. Robot encounters a giant female ape referred to as "Mrs. King Kong" on Dinosaur Island who saves him and his allies from a Tyrannosaurus. 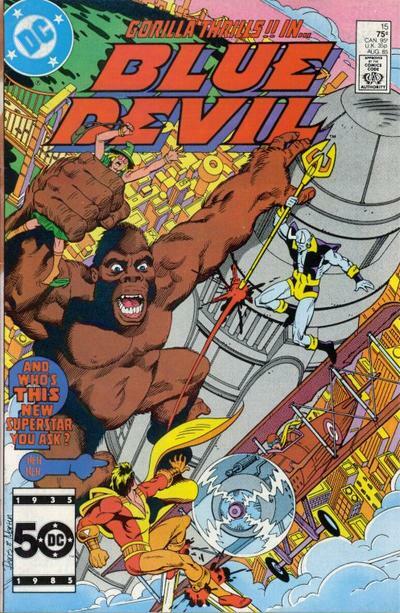 In 1985's Blue Devil No. 15, Blue Devil battles a giant robot King Kong that malfunctions at the "King Kong Attraction" located at the "Verner Bros" studio in Hollywood. 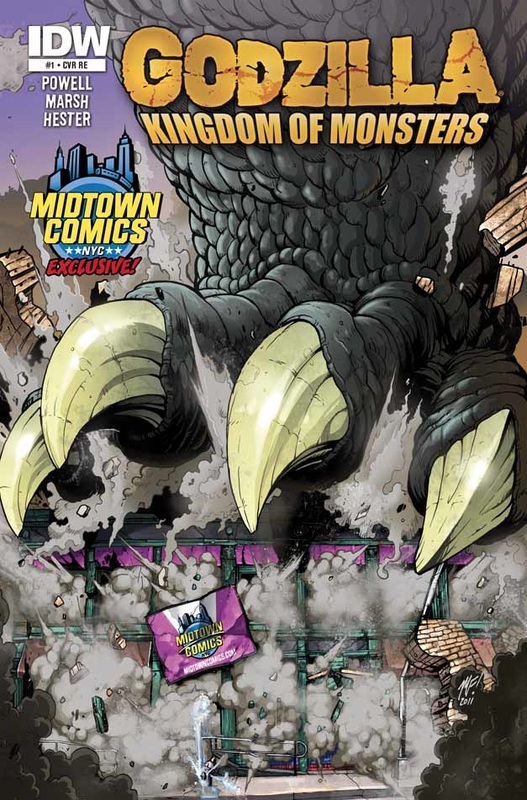 Godzilla: Kingdom of Monsters #1 is the first issue of Godzilla: Kingdom of Monsters. It was released on March 30, 2011. In Japan, a boy and girl play on a beach littered with dead fish. Godzilla suddenly appears, seemingly devouring the two youths. Meanwhile, their father, a fisherman, sees the commotion and is concerned for his children. ​Godzilla comes ashore, and the Japanese military sends out fighter jets. Failing to subdue the monster with these means, the Prime Minister orders a nuclear attack. This however only grants Godzilla atomic breath. The beast continues onward into Tokyo, reducing it to rubble. Shortly, in America, President Ogden is made aware of Godzilla. 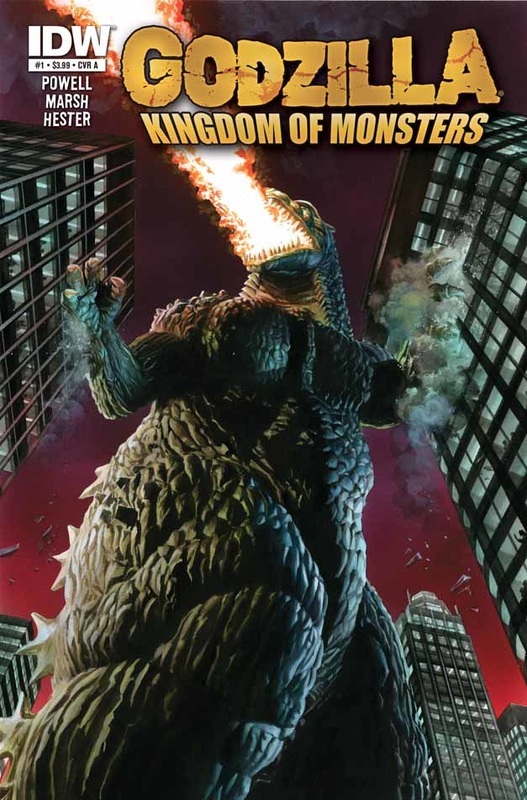 Godzilla: Kingdom of Monsters #1 has the most covers of any Godzilla comic or manga ever, with 80. CLASSIC COMICS: Devil Dinosaur Vol 1 #3 "Giant"
After being woken up in the middle of night by a loud strange sound, Devil Dinosaur and Moon Boy go to investigate a strange figure whose encouraged on them sleeping. After giving chase, a giant rock is hurled at Devil throwing him off balance, a feat which no living creature should be able to do. Continuing the search Moon-Boy sees a figure that is bipedal with a Thunder-Horn Head. The next morning Moon-Boy leaves alone and finds the figure, turning out to be a Giant humanoid wearing a mask, fighting Bone-Back. After defeating Bone-Back, the Giant calls out Ruka and Moon-Boy attempts to leave but is captured by another figure. Meanwhile, Devil Dinosaur has discovered Moon Boys disappearance and follows a trail of dinosaur body's to the Giant. When he meets up with The Giant, a battle ensues but both seem equally matched so Devil attempts to lure The Giant to a bog. The Figure who captured Moon Boy is revealed to be a much smaller Giant figure, escaping his captive Moon Boy leads the younger Giant to the same bog that Devil is at, just as the Giant is tricked into falling in. Moon Boy then reveals that Th younger giant is the other ones cub and they proceed to rescue the giant from the bog and he leaves with his son in arms, with a truce between the Big Ones and Devil Dinosaur been formed. 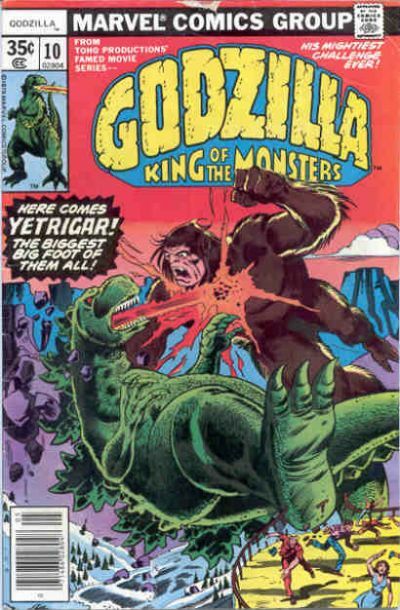 CLASSIC COMICS: Godzilla Vol 1 #10 "Godzilla Vs Yetrigar"
​Synopsis for "Godzilla Vs Yetrigar"
An underground nuclear test is conducted by the US Department of Defense in Arizona, but yields some unforeseen side-effects. The radiation from the test is channeled into an underground rift, a subterranean passage stretching from Arizona to Alberta, Canada. In Alberta, the radiation comes to fill an ice cave, within which a hairy, near-human creature is encased in a glacial tomb, one of the legendary Sasquatch. The Sasquatch is freed from the ice by the radioactivity and revived. The newly revived monster is pained by the continuing effects of the radiation on his body. His mind filled with rage, the bigfoot turns south, towards where he instinctively senses the source of his affliction originates. As he strides southward, however, the radiation begins to make the man-monster start to grow. The S.H.I.E.L.D. Helicarrier follows the trail of Godzilla from Las Vegas, Nevada to the Grand Canyon in Arizona. Gabe Jones has reservations about using S.H.I.E.L.D. ordnance in the canyon, but Dugan scoffs, calling him a monster-lover. They finally locate Godzilla, but when they do, they also witness the gigantic Big Foot known as a Yetrigar. Hurling a huge boulder at the S.H.I.E.L.D. Helicarrier, Behemoth, Yetrigar takes S.H.I.E.L.D. out of the action. On the bridge of the Helicarrier, Robbie Takiguchi sneaks past the scrambling S.H.I.E.L.D. agents and gains access to the Red Ronin battlesuit. He hopes to intervene on Godzilla's behalf in his battle against Yetrigar. Yetrigar ambushes Godzilla at the rim of the Grand Canyon, causing both monsters to topple into the natural wonder. The fall doesn't give them pause however, and they continue clawing and biting at one another. Godzilla blasts Yetrigar with his flame breath, but Yetrigar deflects it with a giant boulder. Godzilla maintains the upper hand though as he batters Yetrigar with his tail, then chomps down on his arm. Yetrigar frees his arm then punches Godzilla across the snout. The battle soon escalates when Red Ronin arrives to prevent the monsters from killing each other. This issue is reprinted in Essential Godzilla, Volume 1. First appearance of Yetrigar. 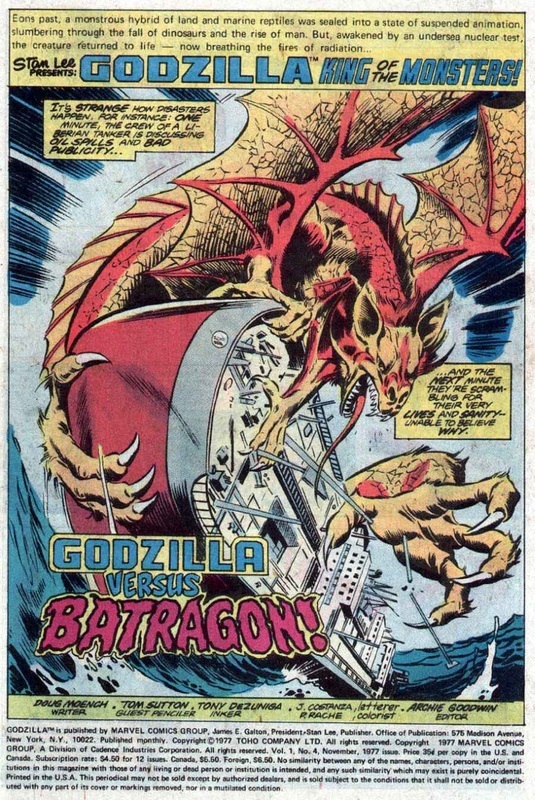 Yetrigar appears next in Godzilla #11. CLASSIC COMICS: Strange Tales Vol 1 #89 "Fin Fang Foom"
Appearing in "Fin Fang Foom!" Synopsis for "Fin Fang Foom!" 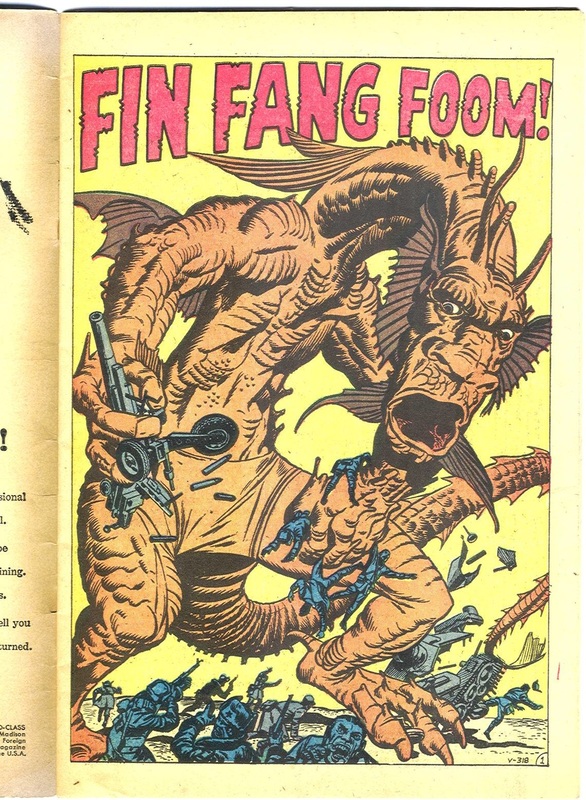 Fin Fang Foom is deliberately awakened from his slumber in a tomb by teenager Chen Liuchow, whose homeland is under threat from the Communist Chinese. Liuchow taunts Foom with the threat of the sleep herb, goading the dragon into chasing him, and leads him straight into the Communist camp, which Foom decimates. 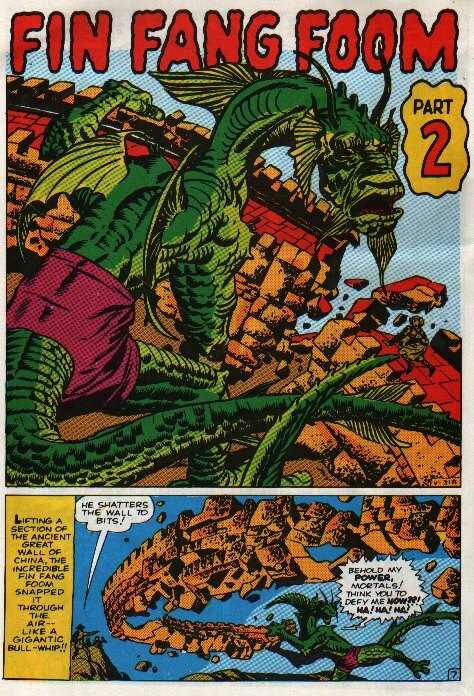 Liuchow subsequently leads Fin Fang Foom back into his tomb, where the application of the herb returns Foom to his sleep. 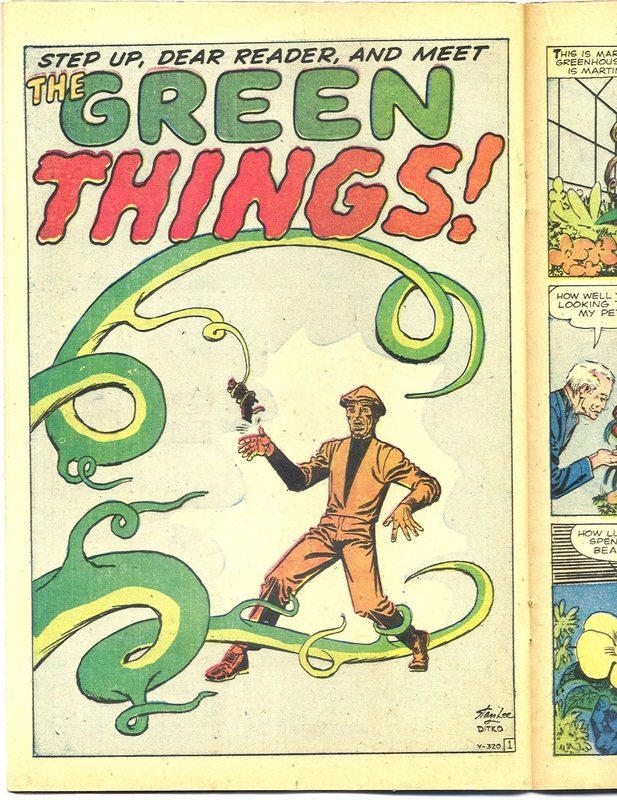 Appearing in "The Green Things!" Synopsis for "The Green Things!" A thief attempts a robbery in a wealthy man's greenhouse but the plants come to his aid and seize the thief's gun and keep him covered with it. Notes: No information for "The Touch Of Midas"
"Fin Fang Foom!" 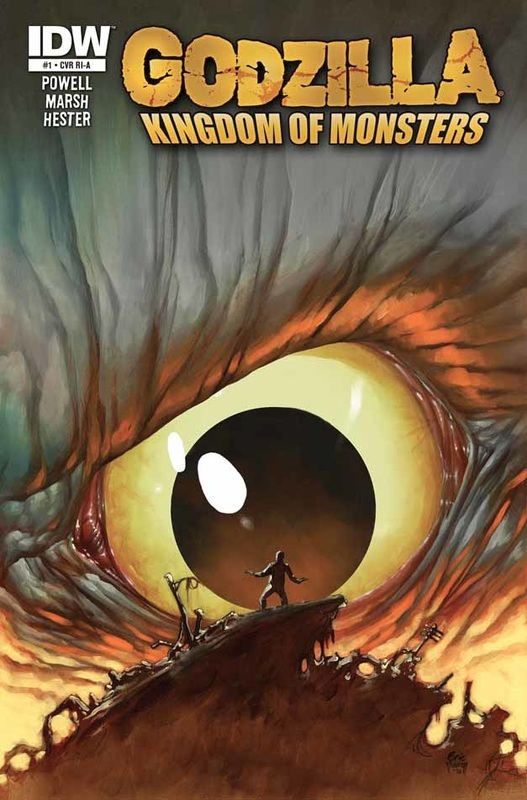 is reprinted in Fantasy Masterpieces (Volume 1) #2, Where Monsters Dwell #21 and Hulk vs. Fin Fang Foom #1. 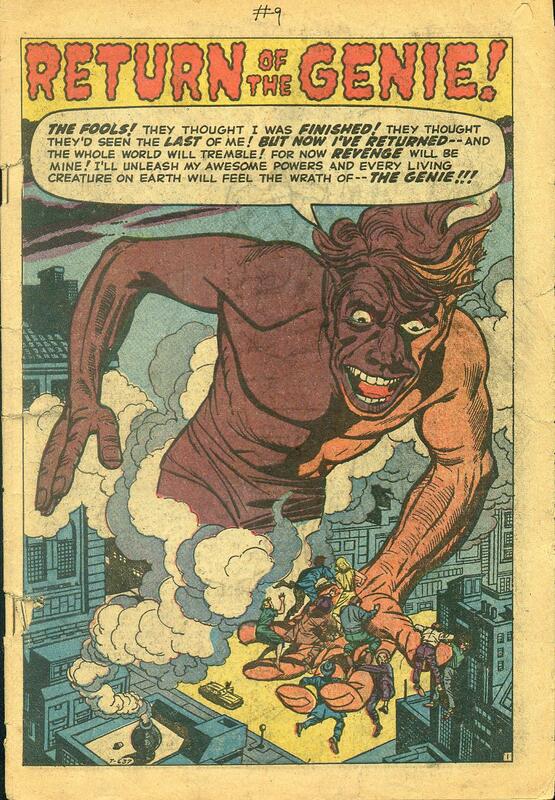 One panel from this issue is partially reprinted in Astonishing Tales #1. 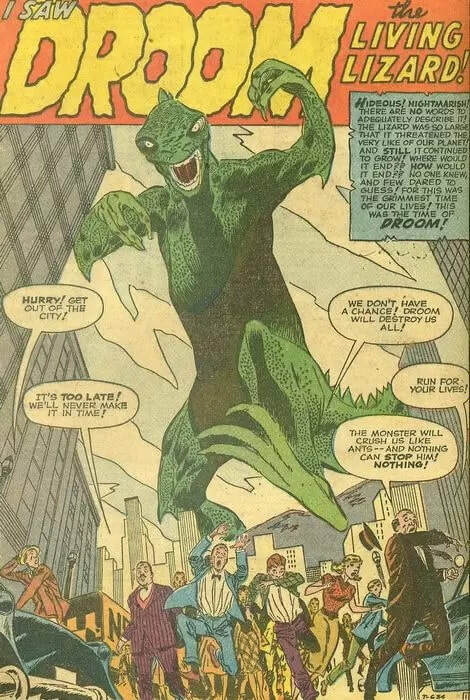 First appearance of Fin Fang Foom, arguably the most famous of Jack Kirby's stable of giant monster characters that were popular in the 1960s. 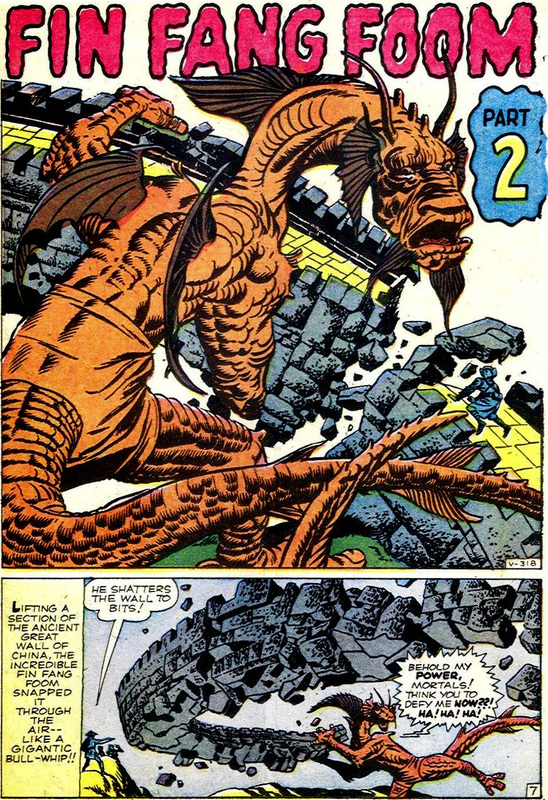 This is the only Silver Age appearance of Fin Fang Foom. He makes a chronologically earlier appearance in the flashback sequences from Iron Man (Volume 1) #274 and #272 (respectively). 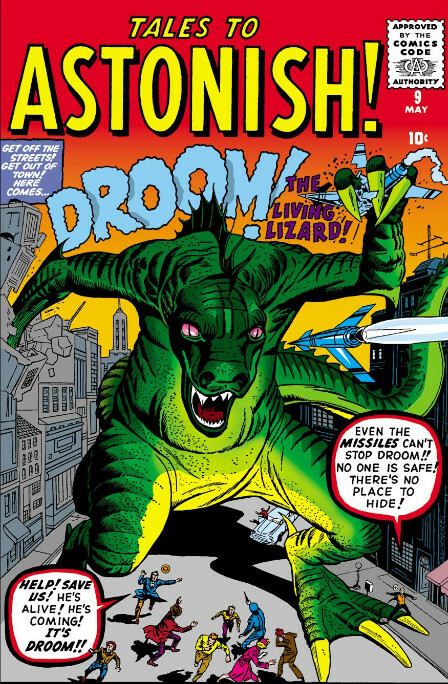 He appears next in Astonishing Tales #23. 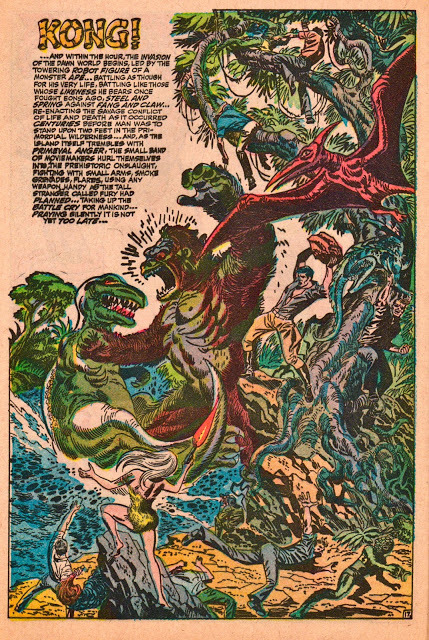 Though Foom was orange in the pages of Strange Tales #89, the cover had him colored green. His later appearances kept that green color, making his debut now seem slightly out of place. A later reprinting of this page changed the dragon’s look to reflect his updated look. Below left is the original version, right is a re-colored version. CLASSIC COMICS: Batman Vol 1 #104 "The Creature from 20,000 Fathoms"
Appearing in "The Man Who Knew Batman's Secret"
Synopsis for "The Man Who Knew Batman's Secret"
Batman and Robin nab a pair of John Varden's hoods using a bazooka to loot a bank. The captured criminals refuse to rat on their elusive boss, but let slip the fact that Varden plans a big operation soon. To trap the gang leader, Batman and Robin hatch a plan and the next day, Batman and Robin patrol the rooftops of Gotham City in plain sight, drawing the attention of a crowd of reporters, among which is Thaddeus Crane, a detective from upstate who has come to study Batman's and Robin's crimefighting methods. Crane climbs to a roof top to interview the dynamic duo, and catches Batman with his cowl off, in the process of changing to Bruce Wayne. Thaddeus Crane announces to the reporters that he knows Batman's secret identity, and Batman and Robin admit they will have to guard him to keep it secret. Crane is hired by the chairman of a camera show featuring a huge camera as an exhibit and a movie company president to guard the exhibits and his bejeweled star Laura Lee, respectively. Though Varden's mob strikes in both places, Batman and Robin thwart their efforts and make it seem as if Thaddeus Crane has overcome the crooks. John Varden's mob eventually cons Crane into their clutches, and he meets with the mobster, though he steadfastly refuses to reveal Batman's identity. But Batman and Robin, who have used Crane (with his permission) as bait for their trap, break in and defeat Varden and his gang. Crane later announces he is leaving Gotham, and disappears forever. But, in the Batcave, it is revealed that Crane was in fact Alfred, Batman's butler, whose middle names are Thaddeus Crane and they planned everything from the beginning in order to capture the crooks. Appearing in "Robin's 50 Batman Partners"
Synopsis for "Robin's 50 Batman Partners"
Batman breaks his ankle during a fracas with the Sparkles Grady mob, and Robin has to take his place as representative at the Batman Exposition. The Exposition, covered on TV, features fifty images of Batman in various forms--as a colossal robot, a giant statue, a mechanical figure on a great clock, and so forth. Grady, watching the program, notes that Robin still holds the pouch of diamonds recovered from their heist, and takes himself and his gang to the exposition after hours where only they and Robin, who is taking photographs of the exhibits, are present. Robin is outnumbered, and endangered when the gang chief orders the Batman-robot to "get" him, but uses the many Batman exhibits (including the mechanical clock figure, who smashes the robot with a stroke of his hammer) to even the odds. Finally, exhausted, Robin tries out a mystery exhibit. It proves to be a giant fireworks display forming a great head of Batman, and its brilliance momentarily blinds the thugs. He nets Grady and his gang with the cape from the giant Batman statue and summons the police to haul them away. Later, at Wayne Manor, Bruce expresses regret that he could not have helped Robin, but Robin replies that he was with him all the time. Appearing in "The Creature from 20,000 Fathoms"
Synopsis for "The Creature from 20,000 Fathoms"
Batman and Robin, as honorary members of the 50 Fathoms Club, a group of underwater specialists, attend a meeting at which deep-sea diver Devoe presents photos of Babonga, a giant saurian monster which appears periodically at a Pacific island which Devoe visited. The members vote unanimously to put up the money to bring Babonga and exhibit it, with all of them together (including Batman and Robin) in on the Babgonga shows up as promised and the club members take aim with rifles loaded with mercy bullets--except that a first shot goes awry and blasts a section of ship's rail out, explosively. Batman, realizing their bullets have been switched, has the hunting party hold their fire and repels the beast with a brilliant flash from a camera. One of the party, he says, wishes to kill Babonga rather than bring it back alive. Batman foils an attempt upon on his own life and lures Babonga out of danger when senses their gas bombs have been filled with poisonous acid instead, but the culprit remains beyond his grasp. Then when the dynamic duo go down in a bathysphere, their connecting chain to the ship is cut--as they had expected. The pair go out in diving suites they had left in the bathysphere and beard Bobanga in its lair, drugging it with paralyzer serum. The two heroes surface with the evidence to condemn the guilty party--Babonga's egg. Devoe, the malefactor, confesses that he had intended to kill Bobanga so that the egg which he owned would the only living member of its species, thus enabling him to make a fortune himself from the exhibitions. Batman replies that he knew his identity after the assault, since the deep grooves on his wrists, caused by his diving suit's sleeves, were a dead giveaway. Bobanga is taken back alive for exhibition and study. Batman remarks later that the egg will take a century to hatch, anyway, and when it does, it will hatch in the trophy room of the Batcave. CLASSIC COMICS: King Kong #3 "Death In Devil's Chasm!" ​Part 3: Death in Devil's Chasm! Kong shakes most of the sailors off the log bridge and into the chasm, where they are eaten by a swarm of giant spiders. Kong's efforts to catch Driscoll are interrupted when Ann is attacked by a large meat-eating dinosaur, an Allosaurus. Kong fights and kills the dinosaur, then picks up Ann and moves on with Driscoll in pursuit. Denham, meanwhile, is sent back for reinforcements. 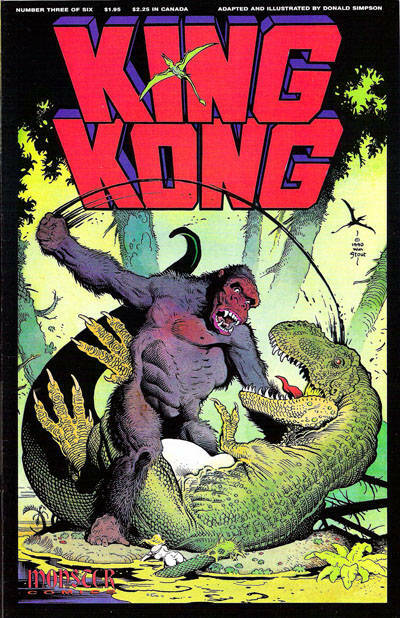 Trivia: Stout's cover shows Kong battling a Tyrannosaurus (when it is clearly an Allosaurus in the actual story). Based on the 1932 novelization by Delos W. Lovelace and thus differs from the movie in numerous places. Notably, the ship is called the Vastator instead of the Venture and the characters of Charlie the Chinese cook and Second Mate Briggs are absent, replaced by a character from Lovelace's novel named Lumpy. The comic also contains several scenes not found in the film including the infamous "spider pit" scenes and extra encounters with dinosaurs by the search party. 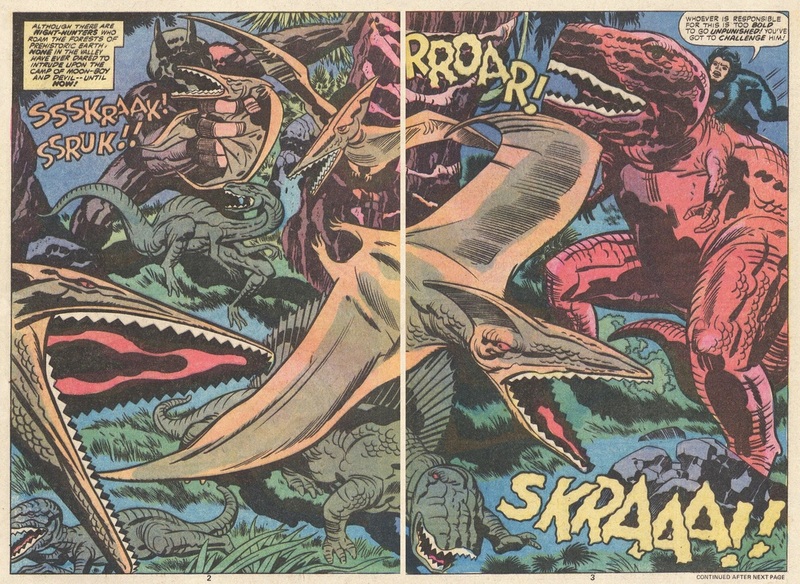 Other notable changes include the addition of a character totally original to this comic, Denham's assistant Wally, and an extended sequence of several dinosaurs joining Kong in attacking the native village. CLASSIC COMICS: Godzilla Vol 1 #18 "Fugitive in Manhattan!" Appearing in "Fugitive in Manhattan!" Synopsis for "Fugitive in Manhattan!" Arriving in New York where Professor Hawkins can study Godzilla, the creature's cage is accidentally dropped and Godzilla gets loose, ending up in New York's sewer system. With the amount of time that Pym's shrinking gas will last in question, it's a race against time as everyone fans out to try to find the creature before it returns to its normal size and rampages through the city. While in the sewers, Godzilla comes face to face with a New York City sewer rat and easily kills the beast. Emerging from the sewers, the creature stumbles upon Rob who had snuck out of the helicarrier himself to find Godzilla to be sure nobody hurts the monster. As the boy is reunited with the monster, it suddenly grows in size to be on par in height with a human adult. Letters (story pages): Saladino (uncredited) page 1, Albers (credited as Diane Albers) pages 2-17. 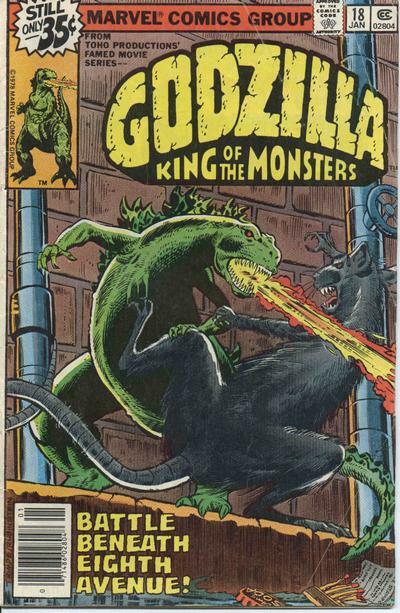 CLASSIC COMICS: Godzilla King of the Monsters #4 "Godzilla Versus Batragon!" Batragon has been attacking oil tankers off the Pacific coast for its master Dr. Demonicus who seeks to use the oil in his operations. However this recent attack is interrupted when Godzilla arrives to attack the monster, bringing SHIELD's Godzilla Squad not far behind. Dugan checks in on Takiguchi and his clan's progress in the Stark plant, before following Godzilla. Godzilla follows the injured Batragon back to the island of Dr. Demonicus who is using a meteor he calls the "Lifestone" to give life to his monsters Batragon, Ghilaron, Lepirax, and Centipor. When Godzilla arrives on the island and begins terrorizing Demonicus' men and the Eskimo slaves they have forced into laboring for them, Demonicus sends Batragon to battle Godzilla once more. When Batragon is killed by Godzilla, Demonicus decides to unleash all his creations to attack Godzilla, just as SHIELD arrives to attack the Godzilla.